Black bears are returning to Missouri. Thought to be extinct in the state, they are being sighted with ever increasing frequency. Females with cubs are not uncommon, and mature males continue to disperse, expanding their range. Bears are doing fine in Missouri; it’s the people that need help! Missourians have not lived with a large carnivore for over 100 years. That transition is happening right now. While there could be difficulties, there are also great opportunities to help make that shift in attitudes easier. 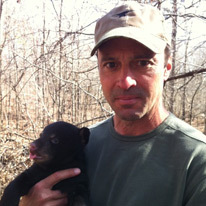 Terry Woodruff is founder of the Missouri Black Bear Foundation and president of the board. An avid outdoorsman and animal lover, Terry has a passion for understanding how mammals survive in their natural habitat and has traveled around the world to observe some of the rarest mammals. Tracking the Highland Mountain gorilla in Ghana, observing primates in the Osa Peninsula of Costa Rica and filming the rare orangutan in Borneo have helped Terry build his knowledge and understanding. His nature adventures have also included a float down the entire length of the Amazon River and traveling throughout Vietnam and Malaysia. 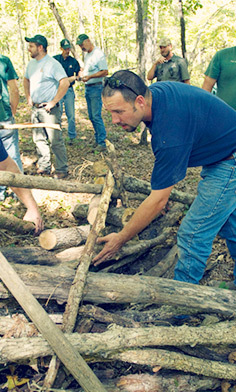 In 2011, Terry learned that black bears were rebuilding their habitat in Missouri. He immediately knew he wanted to help support this effort and contacted the Missouri Department of Conservation to offer his time and resources. Together, a number of trips were planned with lead researchers to track and collar black bears in southern Missouri. As the bear population has grown, and greater information is now available, Terry realized it was time to educate and inform the public about this important native mammal. 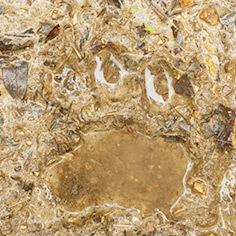 In 2013, he formed the Missouri Black Bear Foundation. Gus Hattrich is an avid outdoorsmen and a strong supporter of Missouri wildlife. 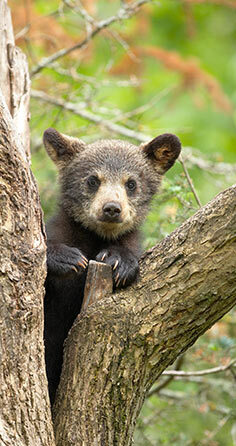 He's excited about the Missouri Black Bear Foundations role in helping build awareness of the Missouri Black Bear, and educate citizens across the state. When not spending time outdoors with his four children, Gus is involved in developing strategic marketing communications plans for clients across many categories. Gus has worked on marketing communications plans for The Missouri Department of Conservation, and The Missouri State Parks Commission. 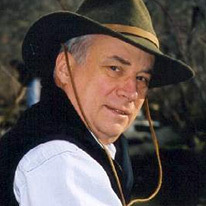 Bob Kipfer retired to a second career in conservation in 2006 after 35 years as a gastroenterologist. Since 1995, The Kipfer family has owned and managed a 400-acre sustainable tree farm on Bull Creek in southwest Missouri. Land preservation efforts on the farm include riparian plantings, warm season grass restoration, habitat improvement and an occasional bear sighting. They are very involved in Missouri Master Naturalists and write the chapter blog at Springfieldmn.blogspot.com. Bob and his wife play an active role in many land and nature preservation organizations, such as the Missouri Native Plant Society, the Missouri Mycological Society, the Missouri Prairie Foundation, Greater Ozarks Audubon Society and Friends of the Garden. Bob’s interest in black bears grew as the bears appeared on his Bull Creek property. He has currently been working with schools in the Springfield, Missouri area to develop “bear aware” educational materials and further promote a more bear-aware public. Charlotte Overby has a lifelong love of nature and all things wild. And, now that she is based in Colorado, that love includes the black bears that frequent her front yard. 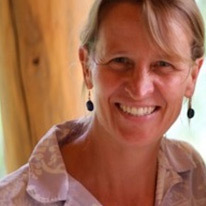 She serves as the rivers coordinator for the Conservation Lands Foundation, an organization based in Durango, Colorado, with the mission to protect, restore and expand the National Conservation Lands through education, advocacy and partnerships. Before joining the Missouri Black Bear Foundation, Charlotte was communications director and acting executive director of the Nevada Wilderness Project. Charlotte worked for Patagonia’s creative services and marketing department in Ventura, California for three years and as a freelance writer, editor and project manager for various natural history publications and nonprofit organizations. In 2001, Charlotte and Jim Karpowicz co-founded Missouri River Relief, a hands-on river cleanup organization that has become a recognized authority on the Missouri River. She plays the double bass and likes bluegrass, klezmer, hardingfele, stringband, old timey, swing, and all forms of hillbilly music. 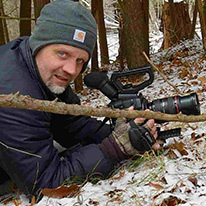 Dave Appleton is owner of UpRiver Productions, a television and video production service specializing in hunting, fishing and other outdoor pursuits. A longtime employee of Bass Pro Shops in Springfield, Missouri, Dave has worked on hundreds of hunting and fishing programs and is intimately connected with sportsmen’s conservation groups across the country. Dave has a passion for wildlife of all shapes and sizes and believes strongly in science-based wildlife conservation through habitat protection and enhancement and proper management of game animals. Appleton is no stranger to black bears, and always feels just a bit more connected to the wild when sharing the landscape with these amazing creatures. 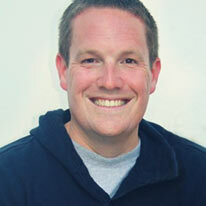 Dave’s hobbies include, hunting, canoe camping, fishing, scuba diving, and watching wildlife. For the past 30 years, Jim has combined his passion for wildlife, wild places and environmental issues with high-quality video production. Transforming complex scientific concepts into compelling stories has become his hallmark. The numerous awards and honors his work has received speak to the popularity of his programs with the general public. 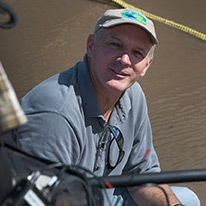 For more than 20 years, Jim was the lead producer for the Missouri Department of Conservation’s Missouri Outdoors televisionprogram. With more than 100 story segments produced, Jim evolved into long-form production, not only for the Missouri Department of Conservation, but also for other state and federal resource agencies. Jim’s award-winning projects have taken him to many locations across the globe, from the jungle rivers of Nicaragua, to the windswept high desert of Eastern Nevada. In 2001, Jim stepped out from behind the camera to co-found Missouri River Relief, a hands-on, on-the-river advocacy group devoted to physically cleaning up the Missouri River. Now, more than a decade later, Missouri River Relief continues its mission through the thousands of volunteers who have picked up hundreds of tons of trash on the lower Missouri River through involvement with this organization. 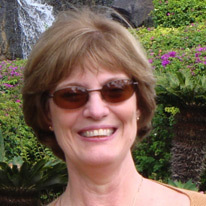 Lori S. Eggert is an Associate Professor in the Division of Biological Sciences of the University of Missouri. She and her students combine field studies with individual-based genetic analyses to study wildlife species that are difficult or dangerous to study with traditional methods. She studies both the contemporary population structure of black bears in Missouri and the evolutionary history of the species across its range in North America.